And the street… and the sidewalk… and the squares… and the doorsteps… and under the bridges… and outside the supermarkets… bums bums all over the place! 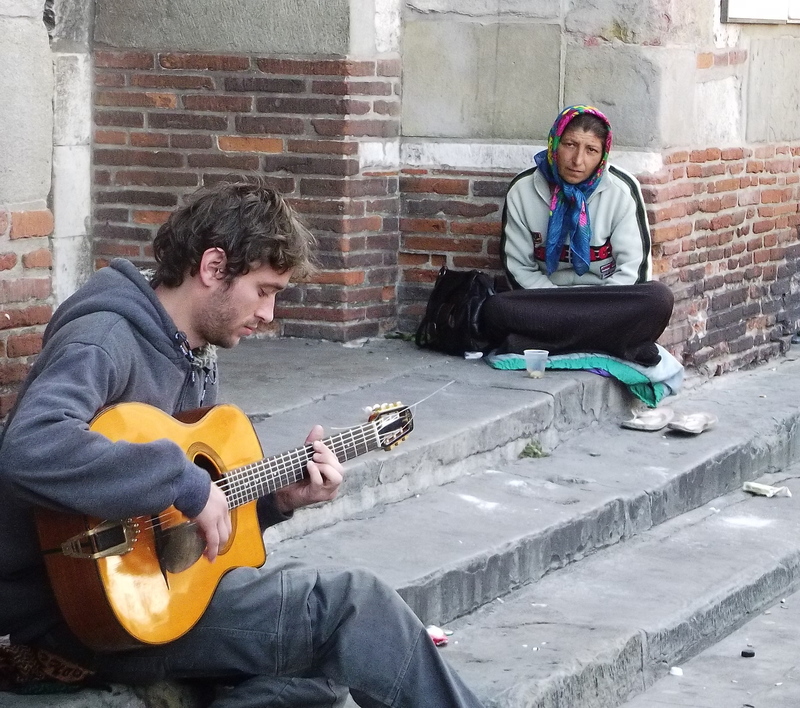 I keep wondering, for a town so small (about 400,000 people) in a country so prosperous, why are there so many homeless people in Toulouse? What happened to ‘no loitering’? I’m not sure if they’re really homeless, or just unemployed. But from what I’ve observed these few weeks, all have dogs, and unfailingly are sitting around drinking $1 cans of 8.5% beer. I have a bit of a hard time sympathising with these guys. I’ve been to a lot of poor countries in South East Asia and seen some serious poverty — people living in shacks, with no running water, no food, people who can’t afford to send their kids to school. Even in Trinidad the homeless are in a pretty bad state and living on the brink. 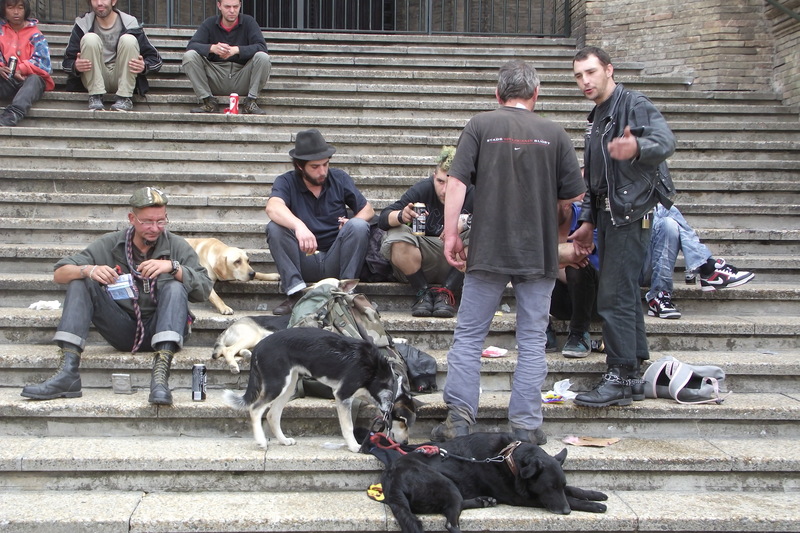 French bums, on the other hand, look pretty healthy, many of them are young and strong, and they seem to have enough cash for tattoos, chunky jewellry, cigarettes and dog food. They don’t look like they’re starving. People from all over the Middle East and Africa migrate to France and will do any job to make their lives better… cleaning toilets, working as waitresses, street sweepers, whatever. So at the risk of sounding like a snob, what’s the problem with these guys? Next Post Liberté, égalité, fraternité? Maybe they’re like the young men liming on the block here in T&T. I’m from Spain and there are many similar-looking people around here. They aren’t homeless, they are “okupas”. It’s a lifestyle where they occupy houses that are abandoned or not currently being used to avoid paying for rent. It’s usually done for reasons besides poverty (politics or values, want to avoid paying for a lot of things, they just have friends who are okupa, etc.). Usually on the extreme sides of the politics spectrum. They’re squatters, basically. I think most have dogs because there are laws saying they can’t be arrested if they have a dog or something like that, I don’t know the details. However, there are many people in Spain (and France, I’m guessing) who like a similar hippy look but live regular lives, they may seem a bit similar to the untrained eye!